Eye emergencies include cuts, scratches, objects in the eye, burns, chemical exposure, and blunt injuries to the eye or eyelid. Certain eye infections and other medical conditions, such as blood clots or glaucoma, may also need prompt medical care. Since the eye is easily damaged, any of these conditions can lead to vision loss if untreated. It is important to get medical attention for eye or eyelid injuries and problems. Eye problems (such as a painful red eye or vision loss) that are not due to injury also need urgent medical attention. A black eye is usually caused by direct trauma to the eye or face. The bruise is caused by bleeding under the skin. The tissue around the eye turns black and blue, gradually becoming purple, green, and yellow over several days. The abnormal color disappears within 2 weeks. Swelling of the eyelid and tissue around the eye may also occur. Certain types of skull fractures can cause bruising around the eyes, even without direct injury to the eye. Sometimes, serious damage to the eye itself occurs from the pressure of a swollen eyelid or face. A hyphema is blood inside the front of the eye. Trauma is a common cause and is often from a direct hit to the eye from a ball. A chemical injury to the eye can be caused by a work-related accident. It can also be caused by common household products such as cleaning solutions, garden chemicals, solvents, or other types of chemicals. Fumes and aerosols can also cause chemical burns. With acid burns, the haze on the cornea often clears and there is a good chance of recovery. Alkaline substances such as lime, lye, drain cleaners, and sodium hydroxide found in refrigeration equipment may cause permanent damage to the cornea. It is important to flush out the eye with large amounts of clean water or salt water (saline). This kind of injury needs medical care right away. 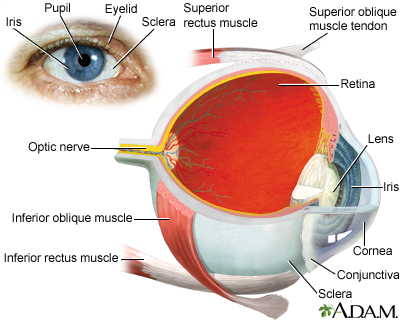 The cornea is the clear (transparent) tissue covering the front of the eye. Dust, sand, and other debris can easily enter the eye. Persistent pain, sensitivity to light, and redness are signs that treatment is needed. A foreign body in the eye may harm vision if the object enters the eye itself or damages the cornea or lens. Foreign bodies thrown at high speed by machining, grinding, or hammering metal have the highest risk of injuring the eye. An injury to the eyelid may be a sign of a severe injury to the eye itself. Take prompt action and follow the steps below if you or someone else has an eye injury. The eye will often clear itself of tiny objects, like eyelashes and sand, through blinking and tearing. If not, don't rub the eye or squeeze the eyelids. Then go ahead and examine the eye. Examine the eye in a well-lighted area. Do not press on the eye. To find the object, have the person look up and down, then from side to side. If you cannot find the object, grasp the lower eyelid and gently pull it down to look under the lower eyelid. To look under the upper lid, place a clean cotton swab on the outside of the upper lid. Grasp the eyelashes and gently fold the lid over the cotton swab. If the object is on an eyelid, try to gently flush it out with clean water. If that does not work, try touching a second cotton swab to the object to remove it. If the object is on the surface of the eye, try gently rinsing the eye with clean water. If available, use an eye dropper or a bottle of eye drops, such as artificial tears, positioned above the outer corner of the eye. Do not touch the eye itself with the dropper or bottle tip. A scratchy feeling or other minor discomfort may continue after removing eyelashes and other tiny objects. This should go away within a day or two. If discomfort or blurred vision continues, get medical help. Leave the object in place. Do not try to remove the object. Do not touch it or apply any pressure to it. Bandage both eyes. Covering both eyes helps prevent eye movement. If the object is large, place a clean paper cup or something similar over the injured eye and tape it in place. This prevents the object from being pressed on, which can injure the eye further. If the object is small, bandage both eyes. Get medical help right away. Do not delay. Flush with cool tap water right away. Turn the person's head so the injured eye is down and to the side. Holding the eyelid open, allow running water from the faucet to flush the eye for 15 minutes. If both eyes are affected, or if the chemicals are also on other parts of the body, have the person take a shower. If the person is wearing contact lenses and the lenses did not flush out from the running water, have the person try to remove the contacts after the flushing. Keep flushing the eye with clean water or saline for at least 15 minutes. Seek medical help right away. Do not delay. Gently apply a clean cold compress to the eye to reduce swelling and help stop bleeding. Do not apply pressure to control bleeding. If blood is pooling in the eye, cover both eyes with a clean cloth or sterile dressing. Carefully wash the eyelid. If the cut is bleeding, apply gentle pressure with a clean, dry cloth until the bleeding stops. Do not press on the eyeball. Cover with a clean dressing. Place a cold compress on the dressing to reduce pain and swelling. Do not remove contact lenses unless rapid swelling is occurring, there is a chemical injury and the contacts did not come out with the water flush, or you cannot get prompt medical help. Do not attempt to remove a foreign body or any object that appears to be embedded (stuck) in any part of the eye. Get medical help right away. Do not use cotton swabs, tweezers, or anything else on the eye itself. Cotton swabs should only be used on the inside or outside of the eyelid. There appears to be a scratch, cut, or something has gone into (penetrated) the eyeball. Any chemical gets into the eye. Nausea or headache occur with the eye pain (this may be a symptom of glaucoma or stroke). There is any change in vision (such as blurred or double vision). Supervise children carefully. Teach them how to be safe. Engel K, Page M, Montezuma S, Cameron JD. Surgical and nonsurgical trauma. In: Tasman W, Jaeger EA, eds. Duane's Foundations of Clinical Ophthalmology. 2013 ed. Philadelphia, PA: Lippincott Williams & Wilkins; 2013:vol. 3, chap 6. Gelston CD. Common eye emergencies. Am Fam Physician. 2013;88(8):515-519. PMID: 24364572 www.ncbi.nlm.nih.gov/pubmed/24364572.